Home / Blog / What Is Direct Cremation and How Much Does It Cost? For the first time, more Americans are opting for cremation than a traditional funeral. A direct cremation (where the deceased person is cremated immediately after death without a formal ceremony) is an affordable and attractive choice for many families. There are many questions surrounding the process, so we’ve compiled a comprehensive list of reasons for why more people are choosing direct cremation. Cremation is defined by the Cremation Association of North America (CANA) as a mechanical, thermal, or other dissolution process that reduces human remains to bone fragments. These bone fragments are then processed further into cremated ashes. Formal ceremony – A viewing or funeral service is not necessary as the deceased is cremated immediately after passing on. Embalming – Embalming and other body preparation services are not required since there is no visitation and the body will not be seen. Casket – An expensive wood or metal casket is not essential. The crematory typically offers a cremation casket or alternative container for use during the cremation process. After the process is complete, the cremated ashes are returned to the family. The crematory will provide a basic container or cardboard box to store the ashes, but most families prefer to bring their own cremation urn to collect their loved one’s remains. Why Would Someone Choose Direct Cremation? If you are pre-planning your own cremation service – or making end-of-life arrangements for a loved one – there are a variety of reasons to choose direct cremation. Most often, however, it comes down to affordability and flexibility. When compared to other funeral options, direct cremation is the least expensive choice possible. Skipping traditional funeral hallmarks and their related expenses (e.g. embalming the body, holding a viewing, purchasing a casket), can save you a lot of money. Even the most basic features of a funeral service can easily break a budget. It makes sense to compare the costs of cremation vs. burial, especially for people facing financial difficulties or for families who didn’t make funeral plans in advance. After a loved one passes, it’s not easy to make arrangements quickly when you are grieving and under pressure. Direct cremation is an excellent option because it offers a great deal of freedom and flexibility. Families can take time to cope with their loss, and later make plans for a memorial celebration weeks (or even months) afterward. This also gives funeral guests enough time to make travel plans to attend the ceremony. Since a memorial service is usually less structured, you can plan a celebration of life ceremony that is personalized but still respectful to the memory of the deceased. Transportation – picking up the body from the place of death and transporting it to the crematory. Paperwork – preparing and filing the necessary paperwork (including the death certificate). Casket – The crematory provides a temporary cremation casket but will accept one provided by the family (as long as it meets the necessary standards). Cremation – The process that produces cremated remains. Depending on your state, you can choose between flame-based cremation or alkaline hydrolysis. Receiving of cremated ashes – Cremated remains are stored in a box or urn and returned to the family. Some funeral homes own and operate their own crematory equipment. This is a convenient option for families to make all the necessary arrangements with the funeral director. The funeral home, however, will likely include a reduced non-declinable fee for their basic services in the overall cost of direct cremation. 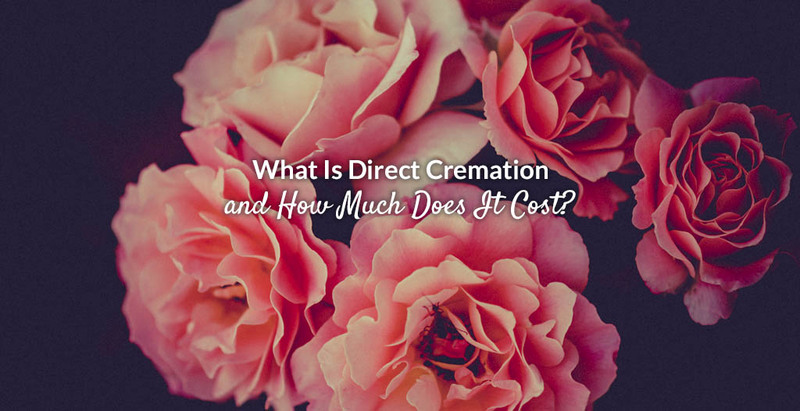 How Much Does Direct Cremation Cost? The total cost of a direct cremation depends on the location and price of supplementary services. Most crematories offer competitive pricing or customized packages to direct cremation consumers, so make sure you do enough research to find out what works best for your budget. We recommend using Funeralocity.com to compare cremation prices in your local area. Funeralocity collects data on cremation costs by sending mystery shoppers to funeral homes across the country to get information on prices and fees. 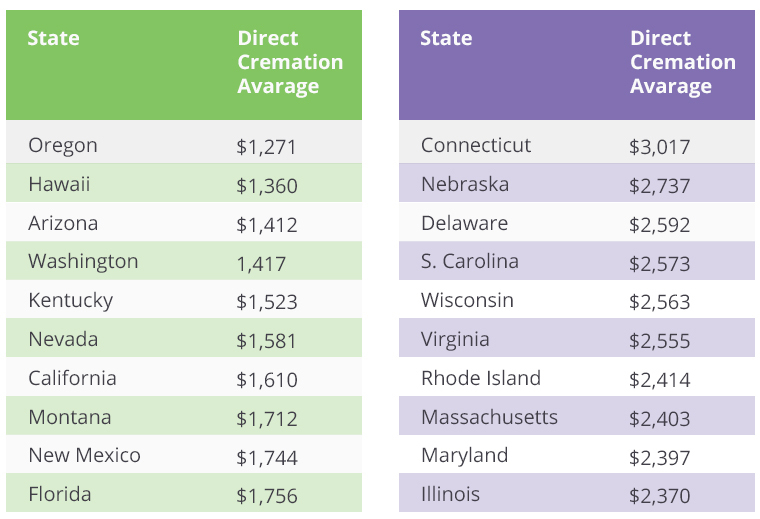 Based on this analysis, the national average cost of a direct cremation is $1,924 (62% less than the cost of a full burial). There may be additional costs that are related to the final disposition of cremated ashes. The deceased’s cremated remains can be buried in a cemetery in a grave or even above ground in a columbarium niche. Burial costs associated with a cemetery burial include the price of the grave plot or niche, as well as the interment fees (opening and closing the burial space). Cremated ashes can also be scattered in a cemetery garden specifically for this purpose, or in a location that was meaningful to the deceased person. Some families create a special memorial space for their loved one’s cremation urn in the family home. To work within your funeral budget, it’s important to begin pre-planning your own cremation. Planning in advance allows you to compare prices and services between providers, and arrange a cremation service based on your personal preferences – not someone else’s. Discover more about how pre-planning a cremation can save money and give you (and your loved ones) peace of mind.